Raiders have stolen thousands of pounds from a Post Office in Fulwood after blowing up a cash machine. The Sharoe Green Post Office in Garstang Road was targeted on Wednesday at around 11.40pm, when a criminal gang pulled off a blitzkrieg raid. Sharoe Green Post Office in Garstang Road, Fulwood will remain closed for several days. The daring raid lasted no more than ten minutes as the men, all wearing hoods, used gas to blow up the cash machine and gain entry to the store. Neighbours said the explosion sounded like "a bomb going off". David Ward, who lives opposite the Post Office in Green Drive, said he immediately ran outside to see what had happened. "I heard this huge boom like a bomb going off. I've never heard such a bag before. The Sharoe Green Post Office has suffered extensive damage after criminals exploded a cash machine at 11.40pm on Wednesday, January 17. "So I ran outside to see what was going on and saw three men, all in black with hoods up. "They can't have been there five minutes before they got into a top of the range, black Mercedes-Benz E class. "They were gone in seconds, speeding off towards the motorway. "Bits of the cash machine were everywhere. The keypad was on the other side of the road." The damaged cash machine which had been looted. Rakesh Chapanery, manager of the Post Office, said the large explosion had caused significant damage to the store. "They've really done a number on us. The force of the explosion has even cracked the bulletproof glass at the counter. "It's chaos. Stuff is everywhere and they've completely destroyed the cash machine and taken all the money. "I don't think we'll be opening for a good few days yet." Debris from the explosion, including parts of the cash machine. It is believed the thieves created an explosion by feeding gas into the cash machine. They they gained entry into the shop using power tools before looting the mangled machine of its cash supply. A man who lives on Garstang Road said the "massive bang" had startled him and his neighbours. He said: "We were sat in the house at about 11.40pm when there was this massive bang. "We thought it was a car crash on the main road, but then I heard the alarms going off. The Post Office in Garstang Road, Fulwood the morning after the raid. "I walked to the top of the street and I could see the front of the cash machine hanging off and the glass panels all smashed. "It looked like an earthquake had hit. It was a complete wreck inside, with drinks fridges and printers flung across the shop. The counter was in bits." He added: "There were three or four other people outside looking at what was going on. "This is sleepy Fulwood, it's meant to be a nice area, but recently we've had a shooting and now this. What's going on?" 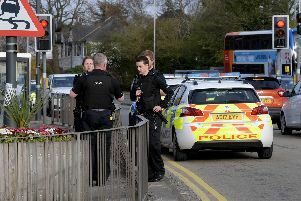 The raid is understood to have lasted less than ten minutes before the men made their high-speed getaway towards the motorway. A police spokesman said: "We were called around 11.40pm yesterday (Wednesday, January 16) following reports of a cash machine theft in Preston. It was reported three men had damaged the ATM machine at the Post Office in Garstang Road. "A quantity of cash was taken during the incident before the offenders made off from the scene in a black Mercedes. "It is believed the vehicle has been recovered in the Wigan area. "An investigation is underway and enquiries on-going." Anyone with information is asked to call 101 quoting log number 1592 of January 16. The shop has been badly damaged by the explosion. The cash machine after the explosion. The Sharoe Green Post Office in Garstang Road, Fulwood will be closed for several days after the raid caused significant damage.